What does a Vervet Monkeys look like? 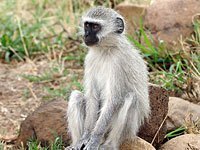 There are several subspecies of vervet monkeys, but generally the body is a greenish-olive or silvery-gray. The face, ears, hands, feet and tip of the tail are black, but a conspicuous white band on the forehead blends in with the short whiskers. 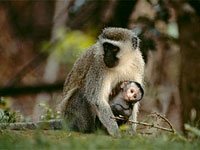 The vervet is classified as a medium-sized to large monkey-males weigh up to 17 pounds. Its tail is usually held up, with the tip curving downward. Its arms and legs are approximately the same length. 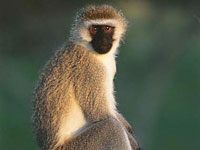 Where do Vervet Monkeys live? This small, black-faced monkey is common in East Africa as it adapts easily to many environments and is widely distributed. In East Africa these monkeys can live in mountain areas up to about 13,000 feet, but they do not inhabit rain forests or deserts. Their preferred habitat is acacia woodland along streams, rivers and lakes. They are diurnal, sleeping and eating in trees from which they seldom venture. What does a Vervet Monkeys eat? Leaves and young shoots are most important in the vervet diet, but bark, flowers, fruit, bulbs, roots and grass seeds are also consumed. The mainly vegetarian diet is supplemented with insects, grubs, eggs, baby birds and sometimes rodents and hares. Vervets rarely drink water. Did You Know this about vervet monkeys? 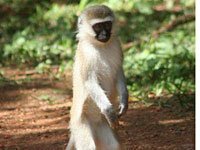 Vervet monkeys living near areas inhabited by people can become pests, stealing food and other items and raiding crops. Good climbers, jumpers and swimmers, they often elude capture. Download free Vervet Monkey wallpapers, click on the image to open the large version. Print free Vervet Monkey coloring pages, click on the image to open the large version.